May 2012 | On May 22nd, activists and community members gathered at Boeung Kak Lake (BKL) to protest the construction of a massive luxury development project which has led to widespread forced evictions and is expected to affect nearly 20,000 people in the area. Protesters tried to indicate where the demolished family homes once stood by erecting poles and markers, however police forces quickly stopped the activists. Despite this, peaceful demonstrations continued at the site of the evictions. Later that afternoon, police violently broke up a group of women singing songs and arrested 13 of the women, including a 72 year-old. WITNESS partner organization, LICADHO quickly released a video and statement condemning the use of violence and arrest against peaceful protesters. 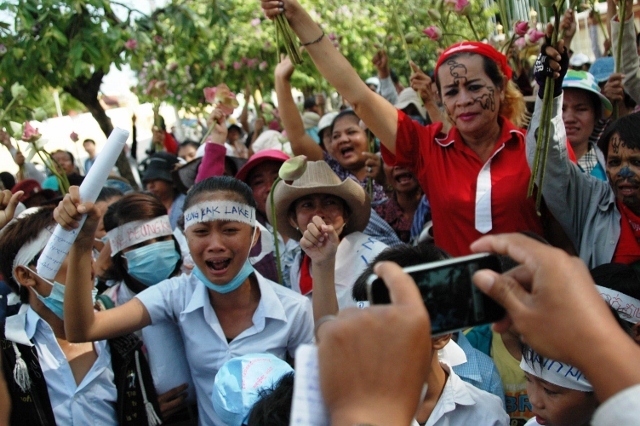 Several days later, the women were put on trial as their supporters gathered in front of the Phnom Penh courthouse to peacefully demonstrate against their arrest. During the protests, two other BKL community leaders were arrested and put in jail. Additionally, the well known Cambodian “multimedia monk”, Venerable Luon Sovath, was forcibly detained and questioned about his activism by religious authorities. Just hours after the Venerable was detained, the women were each sentenced to 2.5 years in prison, with several of their sentences suspended. In response to the Venerable’s arrest and the unjust sentencing of the protesters, LICADHO released another video with footage of the monk’s detainment, as well as another statement. Shortly after, WITNESS, along with Human Rights Watch and Amnesty International publicly distributed three joint letters to donor governments and the media requesting the Prime Minister of Cambodia to reverse the convictions against the BKL activists. Twenty-two governments were also asked to observe the trial of the human rights defenders. As a result of local and international outcry, the 15 BKL human rights defenders were released on June 27, 2012–their sentences upheld, but the remaining prison time suspended. On July 22, LICADHO released a short documentary about the activists, Flowers of Freedom: The Campaign to Free the 15.